Obviously I’m glad that he also welcomes the team. But I was drawn to the comment that “Labour Councillors and Sadiq have lobbied Wandsworth Council to introduce” the new team. Wandsworth Council (like every other council in the country) does not control, manage or in any other way direct the police. We may work in partnership with them, but we do not have any operational control. Now Sadiq is a minister in the Department for Local Government. He was also a Wandworth Councillor for many years before becoming an MP. I suppose it’s entirely possible you could do both those roles without knowing what’s going on (Gordon Brown was Chancellor for ten years, after all), but it is stretching credibility a bit far. The more realistic explanation is that he knows the council is not responsible for the police, but took the gamble many people don’t know. And to his credit it’s actually a pretty good gamble, I’ve spoken to many residents who assume the police are just a part of the council. And it makes good political sense for a Labour MP in a marginal seat. You take credit for good news, and get to imply the Conservative council are the bad guys. So, lesson one: if it’s good, take credit for it. If possible, do this while suggesting your opponents were to blame for whatever wasn’t so good before. I won’t pretend that I or my party are whiter than white. Only this morning I was accused of doing much the same thing, and re-reading my announcement of the news feel I should add to it. I will still give some credit to this to the Mayor, neighbourhood resources are allocated centrally and very little flexibility is allowed. When we’d previously tried to address this, by seeing if resources could be moved to priority areas it was refused out of hand: Boris deserves credit for allowing a more pragmatic approach. 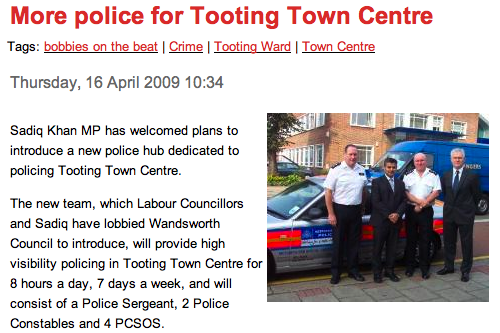 And I will still point out that we have repeatedly asked for town centre teams for Tooting and Clapham Junction. What’s more, we were asking the right people. However, I didn’t give credit to the police borough commander, Chief Superintendent Stewart Low, who actually made it possible by re-organising his teams to free up the sergeant, constables and community support officers necessary to create the team. If there is a single individual who deserves credit it is him, and I’m happy to apologise for not pointing that out when I first had the opportunity. I can assure you that the council and police have worked together across the borough for a long time, without needing any MP to suggest it to us. Indeed, the council police partnership was formalised long before there was a statutory duty for partnership working. Indeed, one of the disappointments of having a government minister in the borough is that, to date, he has never responded to any letters I have sent him asking for support on a number (non-political) community safety issues. On your second point, I’m not sure what point you are trying to say, as you know I am limited in my response on the allegation you make but Jane Ellison widely distributed a leaflet opposing the planning application, exactly the same as Martin Linton. Has Martin Linton been offering some of his publicly funded staff to assist with your campaign? James> Regarding the first part, I understand. I have also contacted politicians who have never answered. Regarding the second part, did I mention Martin Linton? Did I mention funding? Sorry, I understood Martin Linton’s Lavender Hill office had been providing support to your campaign. When you referred to Jane Ellison ‘refusing’ to help I assumed you were comparing to the assistance you’d received from Martin Linton.